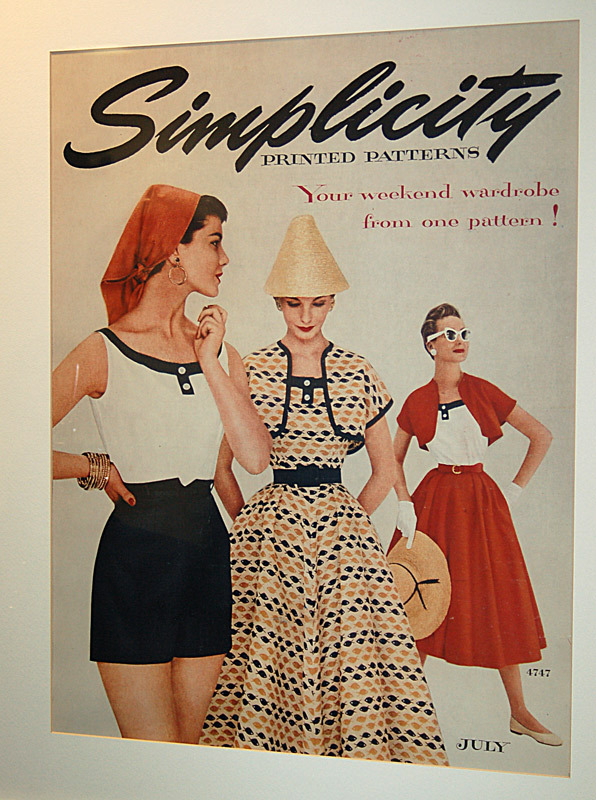 I’ve always loved this picture that hangs in the lobby at Simplicity headquarters here in New York. When I was in the office earlier this week I snapped a photo because I thought you might enjoy it too. Everything about it is great: the color palette (mustard, black, and cream with shots of orange and red), the fish printed in stripes, the black details on the clothing, the tailoring, the tiny waists, the little bolero jackets (and all this time I thought I was anti-bolero), the sunglasses (! ), the fonts, and especially that amazing hat in the center. I’d wear that hat in a heartbeat, and it would feel completely appropriate today, I think. Actually, I’d wear the whole outfit, come to think of it. But I wouldn’t cinch my waist, nor would my waist allow itself to be cinched, like that. I’m certain of that. 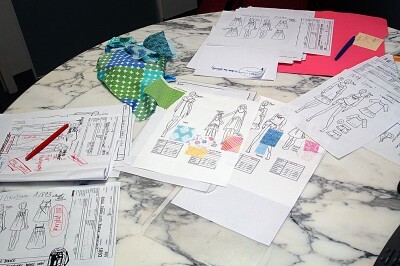 And here is the scene in the conference room as we confirmed which fabrics we’ll be using with each of the new spring 2012 patterns. And which garments will be shot on the model as opposed to which will be shot flat. Sample yardage has just arrived, and the photo shoot is in two weeks. I need to start collecting accessories and working with the stylist at Simplicity so we have everything we need. And meanwhile I’m nearly done with the fall 2012 fabric collection. It’s a constant cycle, always working about a year ahead while simultaneously juggling the current and almost-current materials. I’m always excited to show you what’s next! Liesl, I find this just fascinating. Thank you for sharing! These are the fabrics being sold in JoAnn’s, right? What a great concept. I must find my way to JoAnn’s so I can pick up some fabric and sew up one of your patterns. I really like your style. And yes, you are right – I enjoyed seeing that fabulous picture! How current. I had to zoom in to check out the new patterns, I can not wait for more of your lovely designs. Do you know if your gorgeous fabrics will ever be available in England?